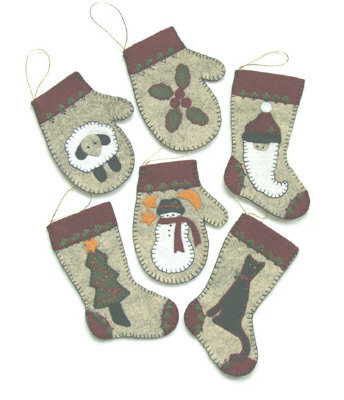 Easily constructed from felt, these lovely Christmas ornaments designed by Rachel Pellman would look lovely on any tree. Designs on the front include a Santa, snowman, cat, sheep, holly and a Christmas tree. Ideal hand work. Kit includes wool felt, embroidery floss, and gold string plus printed pattern.